Posh striker Lee Angol tries to escape from Fleetwood's Antoni Sarcevic. Photo: Joe Dent/theposh.com. 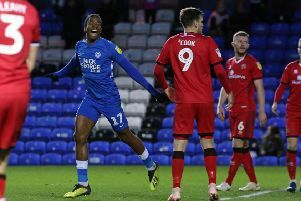 There were some strong individual displays from Posh players, but this was a win for a collective team effort rather than one gained by individual excellence. Marcus Maddison: (for Oztumer, 56 mins). Souleymane Coulibaly: (for Angol, 56 mins). Andrew Fox: (for Washington, 80 mins).